Welcome to my Website and listing of Keyboard Instruments. 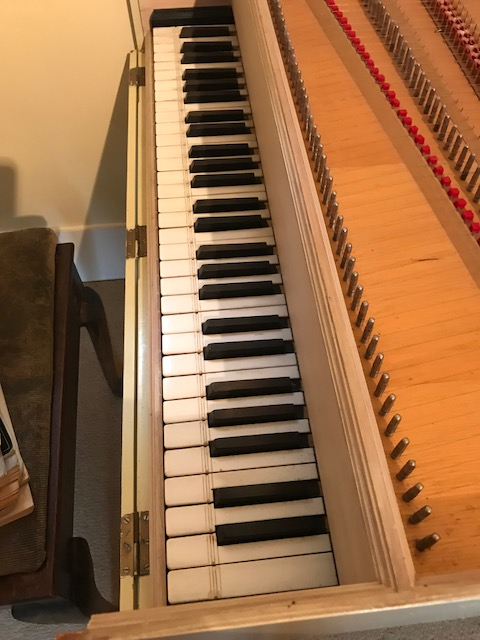 English Harpsichord after Thomas Barton by Peter Barnes 2019. Malcolm Rose Iron and brass wire, 2x8’ harpsichord, walnut case and stand. GG - f3 compass which transposes A440 / 415 without loss of top or bottom notes. 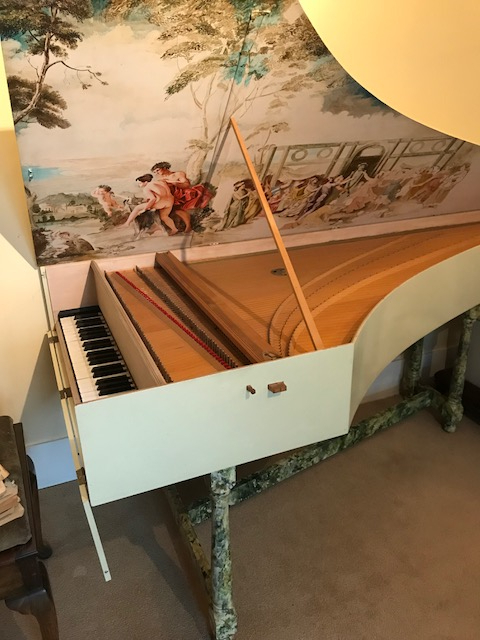 This harpsichord is in the English tradition and is based on the 1713 bentside spinet by Keene and Brackley and the 1709 harpsichord by Thomas Barton. It has traditional wooden jacks, guides and keyboard, a detachable lid with solid decorative brass-work and a folding music desk. The inside of the case and the nameboard are made from Cedar wood, with cross-banded walnut capping. The walnut stand detaches from the harpsichord and can be easily taken apart for transport. This harpsichord is 203cm long, 89cm wide and 20cm deep. It has a soundboard painting by Jennifer Douglas which is closely based on the Coston Harpsichord from the Edinburgh University Collection. This instrument was recently finished and available for sale. Click below for bigger images. Peter Barnes, English Harpsichord after Thomas Barton. Single Manual Flemish Harpsichord after Delin. In process of construction, a single manual Flemish harpsichord, light and of modest proportions. 2 x 8' stops, GG-e3 Transposing 415/440. Price depending on decoration, from £7,000. Double Basses by Peter Barnes 2016 and 2018. 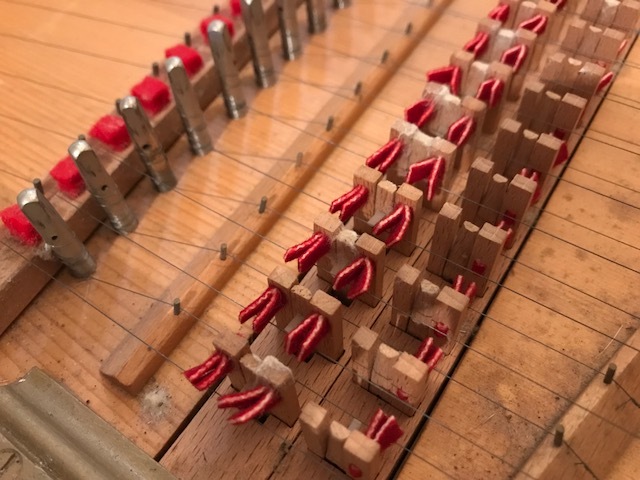 Coming shortly 5 0ctave clavichord after Hass by Douglas Hollick. Made in 1981. Please ask for more details. Due in on 3rd May 2019. Michael Johnson Single Manual Harpsichord - sold. Zuckermann Italian Harpsichord, nicely painted in blue, with turned stand and decorative lid hinges c.1970. Playing on one register but needs attention. £600. Under offer. Unmade Zuckermann Italian Virginal kit 1978. Missing some hardwear parts. £400. Now sold. 110 unused David Bolton white jacks and tongues £120. Virginals, c.1980.With Walnut case and wooden jacks. £1,350. Flemish Single by Stephen Fogg. Now sold. Harpsichord after Kirchmann, made in 1962 by John Barnes. FF-f3 five octave compass. 2 x 8' and 4' stops with buff. Re-strung with Rose Iron and Brass, replacement action cloth and set up. Zuckermann Italian Harpsichord, nicely painted in blue, with turned stand and decorative lid hinges c.1970. One register playing but needs further attention. £600. Double Manual French Harpsichord after Taskin, by Hugh Craig 1980. 2x8' and 4. Buff stop. Transposing 440/415. Case and soundboard decoration in immaculate condition but requires some adjustment, particularly to the top of the upper manual, which is voiced too loudly. The case is 237cm long x 98cm wide and 37cm high. the legs are 59cm high and remove for transport. 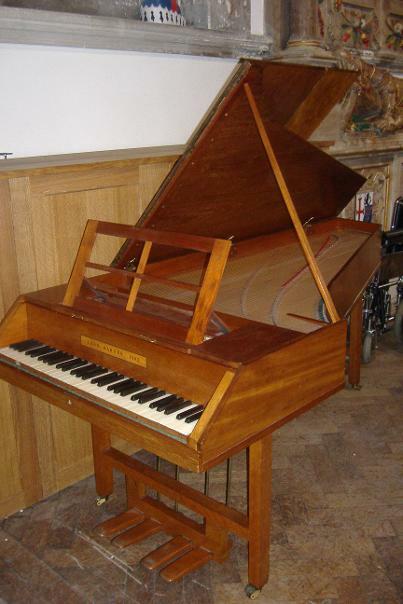 This harpsichord can be seen and played near Saxmundham in Suffolk. I visited it and tuned it to a=440 in February 2019. Walnut case, wooden Jacks and music desk. Strung in Iron and brass wire. BB-d3. Tunes to A=440/415. In good playing condition. Light, and easy to transport. £1350, or £1850 including a custom made walnut stand. Flemish Harpsichord by Stephen Fogg, c.1967. Single Manual 8' with buff and 4' stops. Can be tuned to a=440 or 415 and could be converted to enable the keyboard to transpose. Accomplished and detailed lid painting by Terry Thorn. Price £2,250 or 2,250 euro. Sold. Traditional soundboard painting by Jennifer Douglas, printed papers, turned Chestnut stand and marbled case decoration. 2 x 8' stops plus buff. The compass is GG-e3 and the keyboard transposes 415/440. Available to order from £13,000. Harpsichord after Kirchmann, made by John Barnes 1962. FF-f3 compass, can be tuned to a=440 or 415. 2 x 8 foot stops plus 4 foot and buff stop. Traditional sound, but 'revival' style case design. Re-strung with Malcolm Rose's iron and brass wire, newly set up with new cloth on keyframe. Available for long term hire. Double Bass after Domenico Montagana c. 1750. Baroque neck angle suitable for traditional gut strings. made by Peter Barnes in 2018, Maple neck, sides and back, Sitka Spruce table and ebony fingerboard, for sale £3,800.